Cellular phones with Global Positioning System (GPS) navigation functions are popular now. Wearable devices are available to help induce the desirable direction of human walking. Furthermore, not only the navigation of human walking, but also the navigation of general human behavior is expected to be realized in the future. As for ordinary behavior, a person does not need the navigation by other persons. However, if he/she is standing next to an injured/ill person, he/she needs the instruction of first aid treatment by an expert of first aid treatment. In order to realize general human behavior navigation, we proposed and developed the Wearable Behavior Navigation System (WBNS) using Augmented Reality (AR) technology. This Video archived at the UNESCO website shows the concept of the WBNS. This Video shows the WBNS for use in harsh environments. This research won Netexplo 2012 award. Telexistence, or telepresence, is an advanced form of tele-operation, which enables a human operator to remotely perform tasks with dexterity, providing the user with the feeling that he or she is present in the remote location. 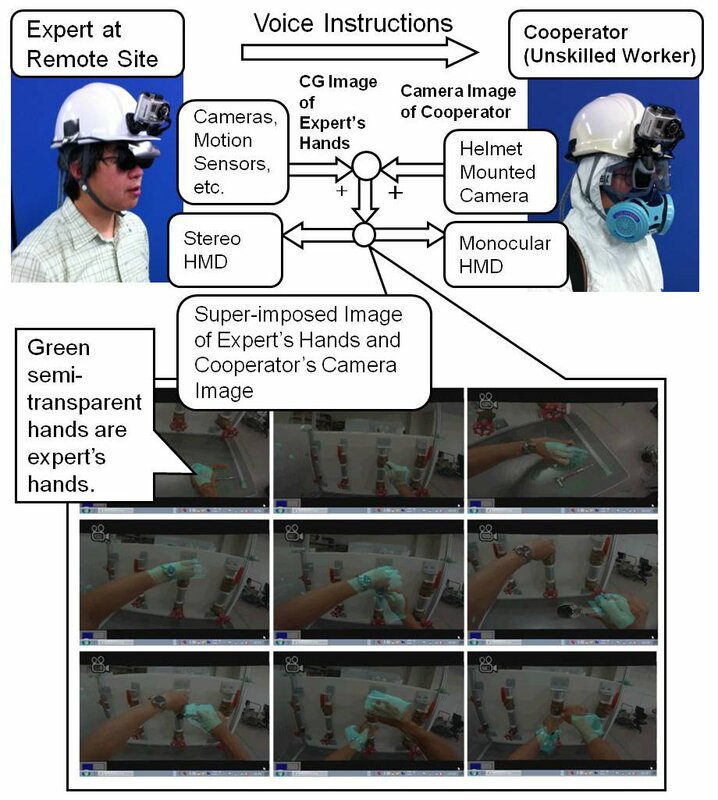 We developed a robot system as shown in the figure on the righthand side for the experimental study of remote robot control using virtual reality. This Video shows some experiments. You can read our paper about the history of the telexistence robots at http://www.ic-at.org/papers/2004/Poster_Session/P-007.pdf. The speed, accuracy, and adaptability of human movement depends on the brain performing an inverse kinematics transformation --- that is, a transformation from visual to joint angle coordinates --- based on learning from experience. In human motion control, it is important to learn a feedback controller for the hand position error in the human inverse kinematics solver. We proposes novel models that learn coordinate transformations of the human visual feedback controller. The proposed models redress drawbacks in current models because they do not rely on complex signal switching, which does not seem neurophysiologically plausible.